The College of Charleston has a robust history of faculty governance, with some of our digital archives dating back to the 1980's! The Faculty Senate structure of senator representatives from academic departments and at-large senators for academic schools, which is still used today, originated in August 1993. Prior to then, faculty governance was held through Full Faculty meetings of all College of Charleston faculty members. Upon creation of the Faculty Senate in 1993, Full Faculty meetings continued to be held in addition to Senate meetings, up through 2009. 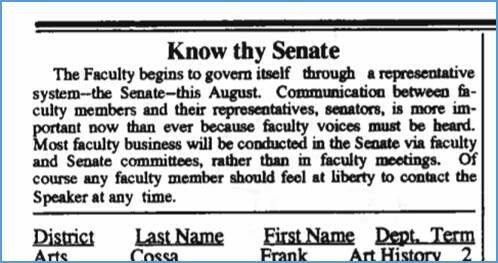 Check out the Faculty Senate Archives to see past records of the Senate and its wide-ranging committees. Coming Soon: Chronological list of Speakers of the Faculty over the years!